Showing results for tags ' today'. 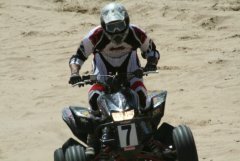 I got a good bit of riding in today I am liking the sport quad! How many of you got to ride this weekend? I discovered the fine line between brave and stupid. Really tough spot I got it in and over it went. It threw me down the mountain and thankfully a tree stopped it before too much speed built up. So so so glad I'm alive. Lesson learned!!!!! oxidized_black posted a topic in General Talk - Anything Goes! Went up and rode some snow !! Snow wasn`t the problem but the ICE was a pain !!! 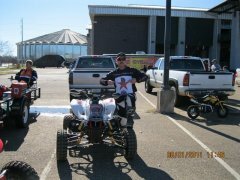 still it was fun to ride with some friends and chill !!! My daughter & I went and rode around an hour today. She made it up her first hill climb then we went up a little tuffer hill she did good. It was a good time!! I need to get her back out there and get a pic of her climbing the hill. Guess what I got from my wife today. Stoopidbot1 posted a topic in General Talk - Anything Goes! Happy Birthday, Admin. May you have another year of "shiny side up"!!! Today we took the new Rhino to a nice easy trail called Rollins Pass East. Rollins Pass is one of the old routes from the mining days. It is a very easy but scenic ride. Good place to break in the new motor. At the summit there is a tunnel called Needles Eye. You can't go through it for safety reasons. The other side of the tunnel is Rollins Pass West. Completely different trail heads. Here is a few pics from today. These are the new Rhino at one of our resting spots. This is a pic of Emerald Lake. An alpine lake at about 12,000 feet above sea level. One of the many shelf roads. You MUST keep your eyes on the road. This is what happens if you don't. We got a new addition today! 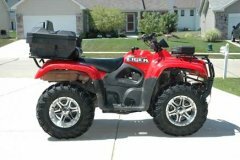 Well, as it said in my sig, my dad and I both have Fourtrax 300's, and today we got a Polaris Predator 500. I'm so excited! I love my Fourtrax dearly, but this Predator will flat scoot! I'm sooooooooooooooooooo happy! Any Boxing Fans? Klitchko wins today. Just watched Wladimir Klitchko win on a second round knockout against Ray Austin (mandatory challenger) in Germany on HBO. Just too easy for him. Vitaly Klitchko is coming back!